Water pipes and a holding tank. Environmental ire seems to follow every move of Chevron's massive Richmond refinery. Last year, activists successfully stalled a major overhaul by pointing out flaws in the company's environmental impact report. More recently, a study compiled by the California Air Resources Board deemed the refinery the state's single largest source of greenhouse gas emissions. But most watchdogs fail to consider the refinery's leviathan water consumption. Using an enormous eleven million gallons every day, it is the East Bay's largest water user. Yet from there the conventional wisdom breaks down: By a number of measures, and thanks in part to a new recycled water plant completed in July, Chevron's Richmond refinery is remarkably water-wise. Chalk this up to significant investments in reclaimed water. Of those eleven million gallons per day, the refinery will soon draw only 3.5 million from potable water sources. The other 7.5 million gallons include 4 million in tertiary-treated effluent from the East Bay Municipal Utility District's North Richmond Water Reclamation Plant, built exclusively for Chevron in the mid-1990s and serving the refinery's cooling towers; and 3.5 million in high-purity recycled water processed by a new $55 million, Chevron-funded, EBMUD-operated plant adjacent to the refinery. The Richmond Advance Recycled Expansion plant feeding Chevron's boilers was publicly unveiled last week and will be running at full capacity by the end of the year, according to Chevron spokesman Brent Tippen. Approximately one gallon of water is needed to refine each gallon of gas, fuel, or oil, he said. These two facilities have helped Chevron become EBMUD's largest user of recycled water. According to EBMUD recycled water program manager Linda Hu, the utility currently serves up nine million gallons of recycled water per day. Eighty-three percent of that goes straight to Chevron. It also is the only Bay Area refinery using recycled water, though Hu says EBMUD is talking with Rodeo's Conoco Phillips. Most other large recyclers are golf courses, she said. "Recycled water has always been a very significant part of our water supply portfolio," Hu said. "As we move into the future, it's going to become even more significant." EBMUD hopes to increase its recycled water volume to twenty million gallons per day by 2040, Hu said. By sheer volume, Chevron is leading the way. That's a nice honor, says David Nesmith of the California Environmental Water Caucus and Sierra Club Bay Chapter Water Committee, but there's a long way to go if we are to live within our state's water means. "The extent to which cooling water can be recycled reduces demand, and that's very important," he said. "It's an important step, and we need to invest a lot more in recycled water for manufacturing and in residential and large institutional settings. There's a lot more to do." The challenge, Nesmith noted, is financial. It takes a lot of money to transport recycled water from a discharge location to a new user. And EBMUD's water rates are so cheap that they disincentivize capital investments in alternative projects. Nesmith believes Chevron has been motivated to make such investments not only because it can afford them, but because reclaimed water drought-proofs the refinery and insulates it from rate hikes and rationing. Both of Chevron's facilities begin with effluent that has been filtered of solids and chemically treated and is safe to discharge to the bay, diverted free of charge from the West County Wastewater District. 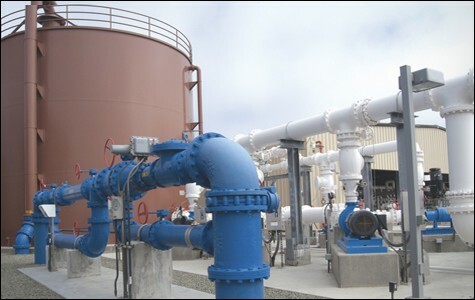 A third level of filtration and disinfection at the North Richmond Water Reclamation Plant makes the water suitable for Chevron's cooling towers. Some of the water is recycled in the towers up to a dozen times, said Tippen, before being discharged to a wastewater treatment facility. Just under half, however, is disassociated into hydrogen and oxygen, because hydrogen molecules are used elsewhere in the refining process. 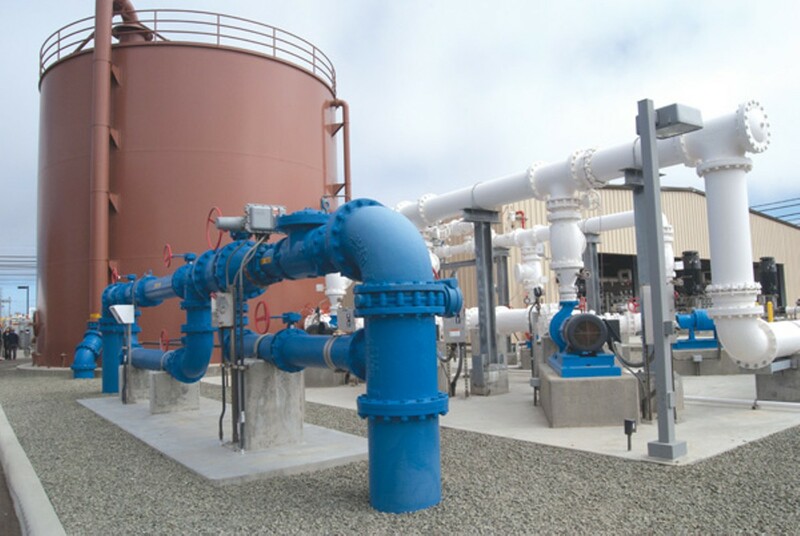 At the new high-purity plant, EBMUD's first foray into reverse-osmosis treatment provides an additional level of cleansing by removing all dissolved solids and metals from the water. The resultant water does not meet technical standards for potable water, said Hu, but "if you were to accidentally touch the water or gulp it, you'd be fine." The energy required to operate the new plant, Tippen said, is less than was previously required for EBMUD to transport and treat potable water for the refinery. Additionally, he said, the higher purity of the water translates to less energy consumption during the refinement process itself. Tippen could not say if the new plant is the culmination of recycled water applications at the Richmond refinery or whether future projects would be in the works. Some uses require potable water under California law, he said, as there are rules about reclaimed water coming into contact with personnel. For now, it appears, Chevron is maxed out. But given the dire state of California's water supply chain, and the public-health benefits of using non-potable water in industrial, commercial, and irrigation settings, Chevron's existing practices should serve as a model — and not, for once, a cautionary tale. Its decision to forego potable water through its two Richmond reclamation plants saves enough water every day to serve the needs of approximately half of the city's population.